[Updated] Karl — which has currently been downgraded from a Tropical Storm to a Tropical Depression — remains a “potential threat to Bermuda” the BWS said, with its closest point of approach to the island within 72 hrs forecast to be 131nm to the south-east at 6.00am on Saturday, Sept 24. 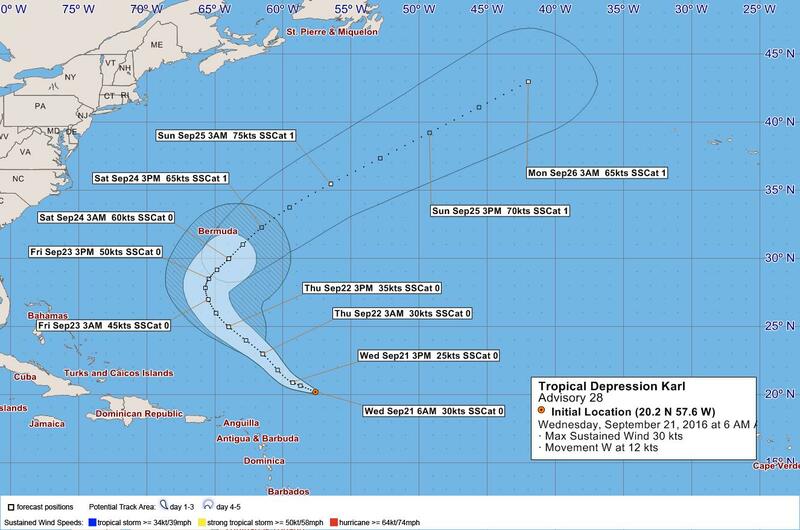 The U.S. National Hurricane Center said, “The depression is moving toward the west near 14 mph [22 km/h], but a west-northwest to northwest motion at a slightly faster forward speed is expected through Thursday. “Maximum sustained winds have decreased to near 35 mph [55 km/h] with higher gusts. Additional weakening is possible today, but some restrengthening is forecast to occur in a day or two. The Bermuda Weather Service said Karl is “a potential threat to Bermuda,” and in their forecast discussion, BWS Forecaster Ken Smith said, “As TS Karl continues to approach it is forecast to become a hurricane by Friday evening. Update 12.14pm: The 12pm update from the BWS continues to say Karl remains a “potential threat to Bermuda,” and its closest point of approach to Bermuda within 72 hrs is forecast to be 154nm to the ESE at 9am on Saturday, Sept 24. Update 6.45pm: The 6pm update from the BWS continues to say Karl remains a “potential threat to Bermuda,” and its closest point of approach to Bermuda within 72 hrs is forecast to be be 149 nm to the south-east at 9am on Saturday, Sept 24. Update 7.32pm: Minister of National Security Jeffrey Baron said, “Although Karl has been downgraded to a tropical depression, forecasters indicate that it remains a potential threat to Bermuda.